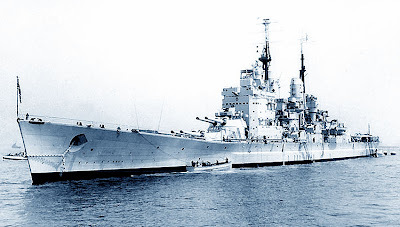 Talking of Hasegawa, there’s an interesting naval kit coming up soon: a 1:450 scale model of the British battleship HMS Vanguard. 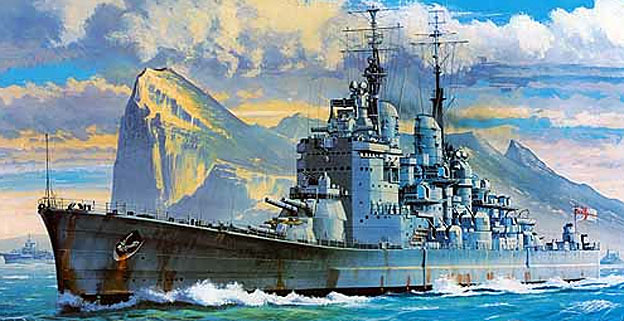 The attractive box art shows Vanguard sailing past the Rock of Gibraltar, and Hasegawa promises a 150-component parts count in the box. It should be worth looking out for, not least for its historical appeal. The photograph shows a much smarter and more shipshape vessel than Hasegawa's somewhat rusty version, but maybe that's a touch of artist's license! HMS Vanguard was ordered in 1941, launched in 1944, but not commissioned until August 1946, 13 months after the end of World War II. She was the last battleship built in the world, and the Royal Navy’s biggest and fastest. She was broken up for scrap in 1960, after a peacetime career in which she never fired her guns in anger. This is the first plastic kit of HMS Vanguard, but it’s a pity the scale is 1:450, instead of 1:700 or 1:350, which are starting to become the warship kit standard scales. Still, as a one-off, the kit should be worth having. In times past, Minic produced a diecast Vanguard in their extensive 1:1200 marine range. The waterline model came with rotating gun turrets, and a Special Edition was released, in which each ship was mounted on a wood plinth made from the decking of the real thing at the breaker’s yard in Scotland. There is usually a small selection of Minic ships for sale on ebay, and it’s worth having a snout around to see what’s available. We looked for Minic stuff on ebay today, and apart from various ships, the items on offer included wharfs, terminals, breakwaters, even a textured sea mat. There was no Vanguard on offer, but the ‘Big Mo’ or ‘Mighty Mo’ USS Missouri was there, at a reasonable starter price of £7.95 GBP ($12.60 USD). The Missouri was also the last of her kind, being the final US Navy battleship, though she did see active service. The Missouri is now a Museum Ship, in Pearl Harbor, Hawaii. See various ship model kits here.